“It would have been easier if I’d been hit by a truck. Then I would have a story for how it began… But I wasn’t hit by a truck, or even a Volkwagen Bug. 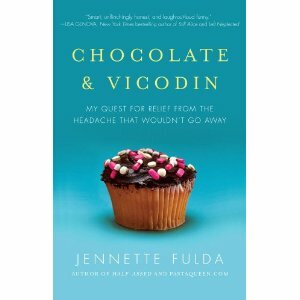 I was hit by a headache.” So begins the funny and informative Chocolate and Vicodin, told by the excellent story-teller Jennette Fulda. Jennette recounts the story of developing a 24/7 headache, which she learns is now named “New Daily Persistent Headache.” She relates the saga of searching for a cure, which turns into hoping for any tiny measure of relief. The evaluations – doctor visits, blood draws, CT’s, headache diaries – go on and on.t one point, she receives a call from a doctor’s office to confirm an upcoming appointment, but doesn’t recognize the doctor’s name. “Who was Dr. Reiner and where was he going to stick a needle in me?” When the office reminds her that Dr. Reiner is her dentist, she writes, “It was official. I had more doctors than I could keep track of.” Chocolate and Vicodin also recounts the treatments she tries – medications, infusions, chiropractor visits, acupuncture – the mix of which threatens to become a full-time job. I won’t reveal how the story ends, but Jennette also explores coming to terms with chronic pain. She writes, “Instead of living in pain, perhaps I could learn to live with pain, as if it were my partner instead of my master. It would always be there, but I didn’t have to let it boss me around.” This book would be a great read for anyone with headaches themselves, or with any type of pain. You’ll not feel so alone, and you’ll laugh. For those with a family member or friend in pain, read this to better understand the pain experience. Jennette will share with you what it’s really like.